This upcoming Fall I’ll be teaching two exciting, brand new courses at Swarthmore College. They’re open to all students on campus, as well as students at Bryn Mawr, Haverford, and some students at the University of Pennsylvania. (Swarthmore music majors or minors can receive credit in the Music Program for these programs with the completion of additional work.) These courses are in development—as part of my ongoing Curriculum Diversity fellowship at Swarthmore—but I’ve included course descriptions below. On Tuesday, April 8, I’ll be hosting an information session at Sharples Dining Hall for any students interested in learning more about them. Please email me at mlomann1[at]swarthmore[dot]edu for more information. From its emergence at the turn of the 20th century in New Orleans, jazz has been a transnational music, incorporating traditions and influences from many cultures, most especially those of the African Diaspora. 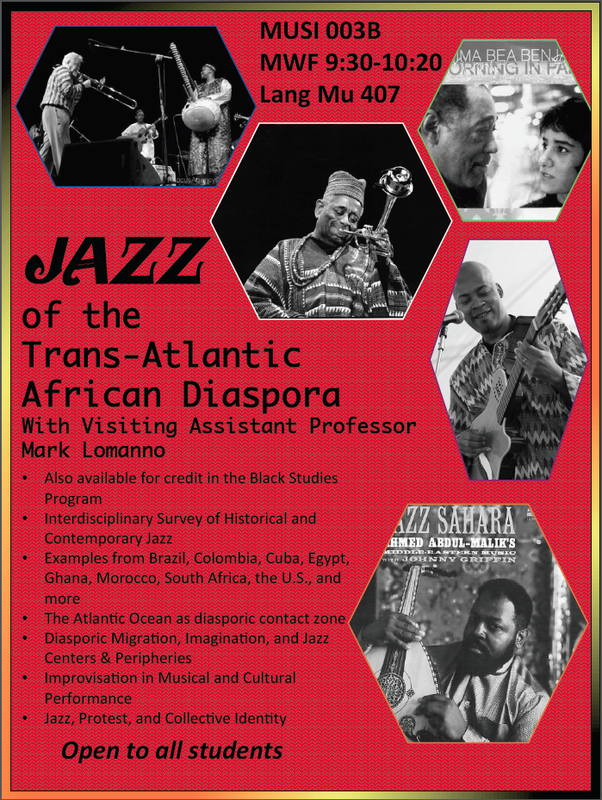 In this course, we will expand study of jazz outside its traditionally bounded under-standing of an exclusively U.S. music — in which Africa usually figures as a distant, cultural antecedent — to include historical and contemporary jazz musicians throughout the Diaspora. In addition to examining various national jazz scenes, we will discuss how African American jazz musicians have imagined the Diaspora and collaborated with musicians in it, and vice versa. We will contextualize our examination of jazz performance as represen-tative, predictive, and descriptive of larger socio-cultural, political, and economic trends. We will draw correlations between improvisation as a musical practice and as a means of individual and collective identity formation, particularly for historically marginalized and subjugated peoples. Jazz music and improvisation have played fundamental roles in engaging with, critiquing, and counteracting episodes of violence and inequality, for example in the fight against South African apartheid. Case studies will include musicians from Brazil, the Canary Islands, Colombia, Cuba, the Dominican Republic and Haiti, Egypt, Ethiopia, Ghana, Morocco, South Africa, and the United States. However, rather than centering our studies on the nation-states or even landmasses in which these musics are situated, we will pay particular attention to the Atlantic Ocean as a contact zone through which many diverse musical and cultural traditions interact. We will also examine the Diaspora critically, focusing on instances when this collective identity marginalizes and excludes certain communities, musicians, and traditions. This course adopts a highly interdisciplinary perspective, drawing from the humanities, social sciences, and fine arts. However, as a music course, we will ground all our discussions with music and music-making practices, emphasizing the centrality and importance of critical listening and building spoken and written vocabularies about music in all our critiques, analyses, and discussions. This course will feature a survey of U.S. popular music from the late 19th century to present day. However, rather than a general overview of all aspects of popular music history, we will be discussing individual case studies of music, musicians, and communities-in-music that demonstrate larger cultural and historical themes with particular attention to how the combination of critical listening, contextual background, and interdisciplinary analysis enriches our understanding of music-in-culture and music-as-culture. 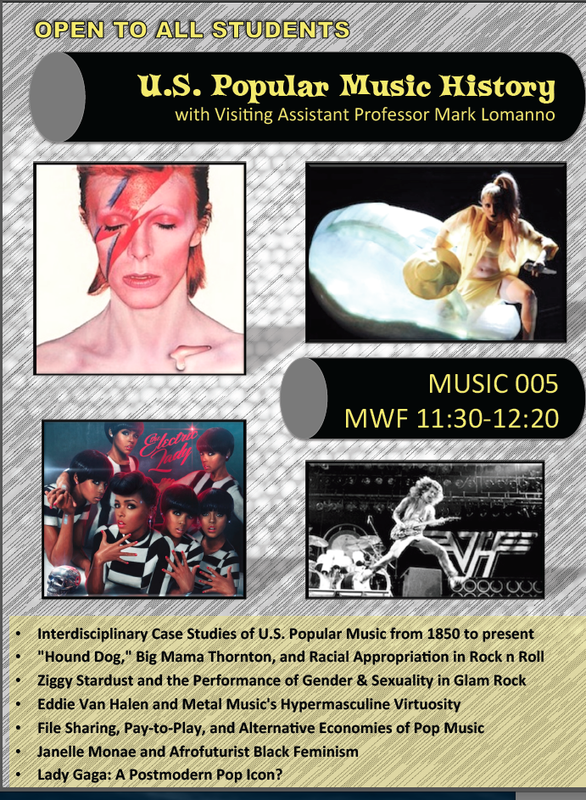 These case studies will include new examinations of significant movements and musicians–such as racial appropriation of R&B in 1950s rock and the performance of gender in glam rock–and will also take a look at the process of history-making by studying lesser known artists and critiquing the exclusionary practices of canon formation. We will discuss popular music as an industry and the effects of capitalist commerce on music-making, as well as political and socio-cultural interventions on music-making and distribution. Examples will include radio payola, legislated censorship, intellectual property law, public noise ordinances, reality music television, and illegal file-sharing practices. Students will engage with all these subjects via class discussions and written assignments, but will also acquire listening skills and basic musical understanding of each style’s characteristics and defining features.